In its most literal sense, arthritis means “inflamed joint.” Arthritis describes any condition where cartilage in the joint breaks down. Normal joints consist of two smooth, cartilage-covered bone surfaces that fit together as a matched set and glide against one other. Arthritis can result when these smooth surfaces become irregular as the cartilage breaks down and don’t fit well together anymore, essentially “wearing out.” Arthritis can affect any joint in the body, and it can be debilitating when it affects the hands and fingers. Rheumatoid arthritis is one of the most common forms of arthritis in the hand, in addition to osteoarthritis and post-traumatic arthritis. Rheumatoid arthritis affects the cells that line and normally lubricate the joints (synovial tissue). This is a systemic condition (can affect the whole body), which means that it may affect multiple joints, usually on both sides of the body. The joint lining (synovium) becomes inflamed and swollen and erodes the cartilage and bone. The swollen tissue may also stretch the surrounding ligaments, which are the connective tissues holding the bones together, resulting in deformity and instability. The inflammation may also spread to the tendons, which are the rope-like structures linking muscles to bones. This can result in fraying and eventual breaking of the tendons. 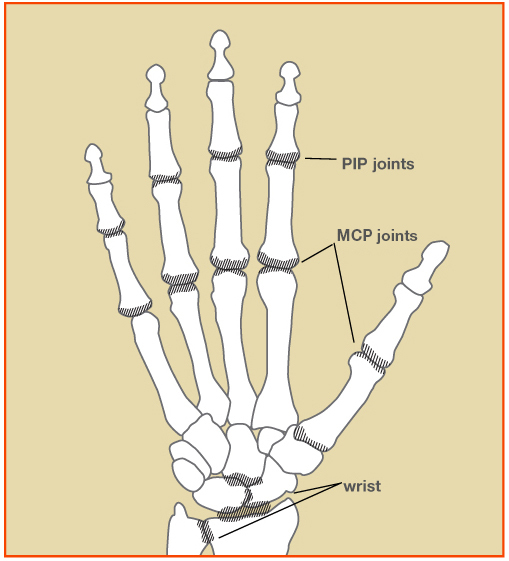 Rheumatoid arthritis of the hand is most common in the wrist and the finger knuckles (the MP and PIP joints (see Figure 1)). Your doctor will examine you to determine whether you have similar symptoms in other joints and to assess the impact of the arthritis on your life and activities. 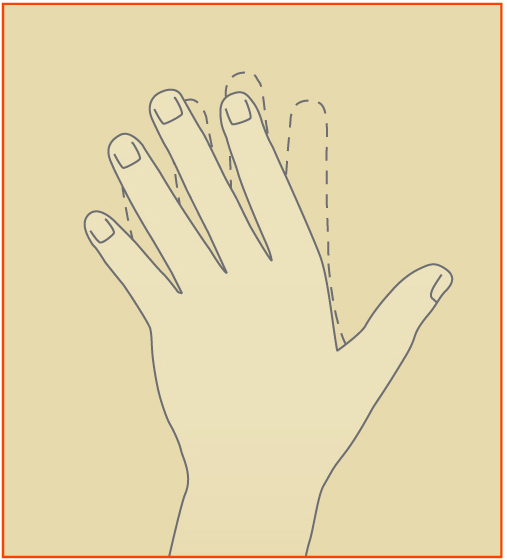 The appearance of the hands and fingers helps to diagnose the type of arthritis. X-rays will show certain characteristics of rheumatoid arthritis such as narrowing of the joint space or erosions of the bone. If your doctor suspects rheumatoid arthritis, he or she may request blood or other lab tests to confirm the diagnosis. Rheumatoid arthritis is primarily treated with medication. Typically, medications for this condition are prescribed by your primary care provider or a rheumatologist. Steroid injections are sometimes helpful, particularly when the condition is more active. Surgery may be needed to relieve pain or improve function during the course of the disease, but it is not needed in all cases of rheumatoid arthritis. Orthopedic Sports Medicine Center of Oregon is located in Downtown Portland Oregon. Dr. Dominic Patillo, one of our Board-Certified Orthopedic Surgeons, specializes in hand surgery. His practice focuses on the treatment of both simple and complex hand and upper extremity conditions as well as general orthopaedic trauma. He is experienced with modern microsurgical techniques including nerve and vessel reconstruction. Other problems treated can include arthritis, nerve and tendon injuries, and congenital limb differences (birth defects). If you have pain in your fingers, hand, wrist or arm, or if you have other upper-extremity related concerns, please consult our hand specialist Dr. Dominic Patillo for a consultation. What Is Psoriatic Arthritis & How Do You Treat It? Do I Need Carpal Tunnel Surgery?